The sense of touch is crucial for medical and dental training. Many diagnostic, surgical and interventional procedures require that physicians train and utilize their sense of touch. 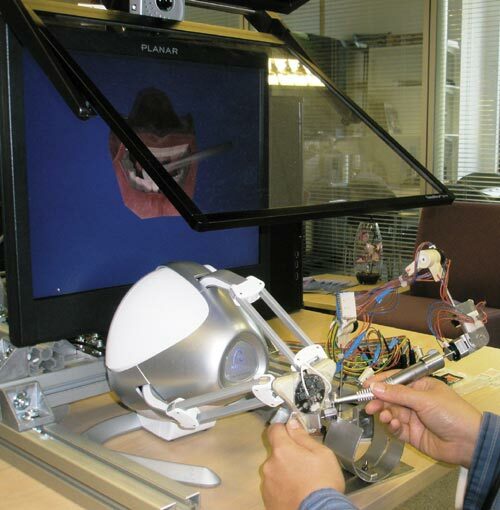 Simulation of a dental procedure is not new, but the pace of development of haptic devices has not always been matched by research into the educational effectiveness of these devices. An evaluated approach comes from the PHANTOM project - Personalized Haptics when Teaching with Online Media, which aims to develop and evaluate haptic and synthetic online devices that will be used by a range of dental students and professionals to transform the quality of their learning. A multidisciplinary team drawn from cybernetics, technology innovation, education, sociology and dentistry are investigating the impact of using such devices. Novint develops 3D haptic technology and products that enable people to experience a realistic sense of touch using their computer. Using the 3D haptic interface device, the Novint Falcon, and patented 3D haptic software, computer users may feel 3D objects, feel their shapes and textures, feel the dynamic properties of objects, and feel many other effects. Novint’s Advanced Products Group is building on Novint’s early success in the games market to build applications involving user interaction with 3D computer data, models or environments in other markets including medical and dental training. 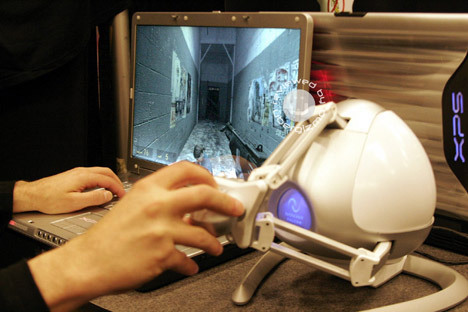 Although haptic devices have been available for commercial applications for many years, these devices have historically cost tens to hundreds of thousands of dollars. The Novint Falcon, which is designed as an affordable consumer controller, represents a significant advancement in the field of haptics, making high-fidelity 3D touch accessible to the consumer market for the first time. 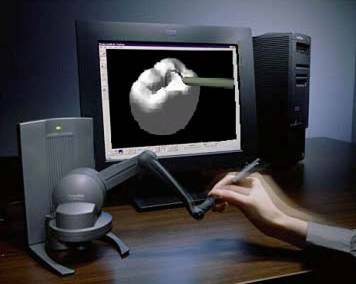 Novint worked with the Harvard School of Dental Medicine to develop VRDTS (Virtual Reality Dental Training System) - the dental training simulator that utilizes a 3 dimensional haptic interface, enabling students to practice a variety of procedures on the computer. During training, a dental student must learn to control surgical instruments very precisely, and develop a sophisticated feel for the interaction of these instruments with patient anatomy. Yet today, most dental students learn basic procedures with plastic teeth, hardly the best way to learn how to operate on live patients. Furthermore, with these traditional training methods, it is nearly impossible to quantify a student's proficiency. To address these shortcomings, Novint is developing a family of e-Touch Dental Simulators which incorporate a very life-like sense of touch, as well as 3D graphics and sound, to provide dental schools with realistic and quantifiable training systems. Using VRDTS dental students work with a virtual decayed tooth and learn to probe it for diagnosis, use a drill to prepare a tooth for cavity repair, fill the prepared cavity with amalgam and carve the amalgam to match the original tooth contour. Unlike plastic teeth, VRDTS enables the student to feel the difference between enamel, dentin, caries, amalgam and pulp throughout the procedure. The student's operation can be tracked precisely in real time, providing quantifiable feedback to both student and teacher. Lastly, since the entire process is virtual, the student has the ability to zoom, rotate and even cut the tooth in cross section to better understand the process. VRDTS offers the student the opportunity to practice procedures as often as needed, with no additional cost for materials. A group of dental and dental hygiene students at the University of Illinois at Chicago pick up instruments and prepare to begin a procedure. In their hands, their tools gently rub against the teeth and underneath the gums, feeling for calculi on the tooth root, measuring pocket depth, and searching for periodontal abnormalities. These students, however, are not practicing on patients. They're using a computer equipped with a 3-D training system to improve their skills. Researchers at UIC's colleges of dentistry and engineering are collaborating to develop a life-like training simulator called PerioSim, which uses haptic virtual reality technology. Over the past several years, dentistry has begun using simulators to train students, but the programs traditionally use tracker technology, not haptics, said Dr. Arnold Steinberg, professor of periodontics at UIC and project leader. With the PerioSim, students guide a stylus on-screen that resembles an explorer -- a sharp, pointed instrument used by dentists during an examination. They can feel life-like tactile sensations as they navigate through various procedures. The device also provides a way for professionals and students to further refine their skills even after having experience with patients, he said. Students can access PerioSim via the Internet. A realistic 3-D human mouth is shown in real-time, and the user can adjust the model position, viewpoint and transparency level. The haptic device allows the student to feel the sensations in the virtual mouth, and a control panel lets the user choose different procedures to practice and instruments to use, Steinberg said. 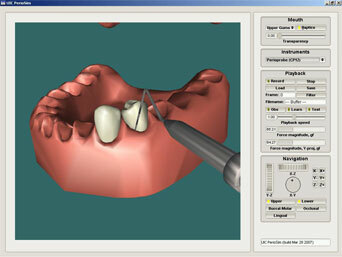 The system allows instructors to create short scenarios of periodontal procedures, which can be saved and replayed at any time. 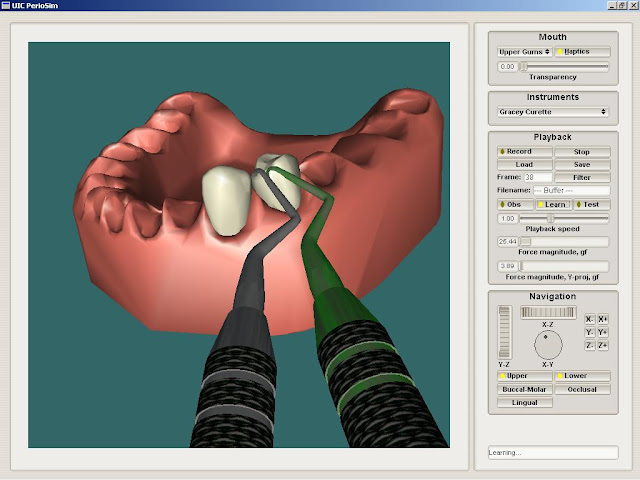 The 3-D component permits students to replay from any angle, so the user can observe different views of the placement of the instrument and gingival relationships during a procedure, Steinberg said. 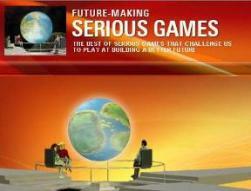 The recorded file can be viewed on any personal computer, and while not in 3-D, it is an actual representation of the original scenario, which offers great training potential, Steinberg said. The program also allows for a second playback mode, where an instructor leads the trainee through the program. By simply holding onto the haptic stylus, the trainee receives the same sensations felt by the instructor. Novint Technologies, Inc. (NVNT) is the pioneer of 3D touch for consumer computing. Novint is developing a new category of products that add high-fidelity interactive three-dimensional touch to computing, beginning with its introduction of the award-winning Novint Falcon. Novint’s sense of touch connects us to the world around us and is an integral part of how we experience things, both physically and emotionally. Games have incorporated increasingly sophisticated graphics and sound design, but none have added realistic touch. In the past, the expense of 3D touch (haptic) hardware made the technology cost-prohibitive, but the Novint Falcon, which is, in essence, a small robot is designed to be an affordable consumer device. The Falcon allows players to feel weight, shape, texture, dimension, dynamics and force feedback. Using the Falcon, players feel a character’s actions instead of controlling a game through mouse clicks or meters. 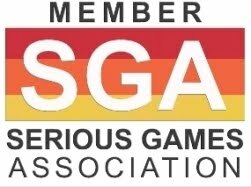 Players feel the weight of a basketball as they shoot it towards a hoop – the momentum and impact as they swing a virtual golf club and strike a ball – the recoil of a weapon – or the characteristics of virtual objects and environments, making gameplay more natural and realistic. Novint is uniquely qualified to bring this revolutionary technology to market. As a leading developer of commercial touch applications, Novint has worked with clients including Lockheed Martin, Chrysler, Chevron, Mobil, Aramco, and Harvard University. Based in Albuquerque, New Mexico, Novint has an exclusive worldwide license to over five years of pioneering research from Sandia National Laboratories, which developed some of the first 3D touch software in the world, and has developed the only low-cost (sub $1000) high-fidelity hardware solution available for consumer or commercial applications.